After last night's late night we were all a bit slow to start this morning. Jen and I didn't really get out until about 10:00 AM to get some coffee and tea across the street. Perhaps more than Jen I was content to just sit at that cafe for the rest of the day, perhaps the rest of my life, but that wouldn't be how we spent our last day in Paris. 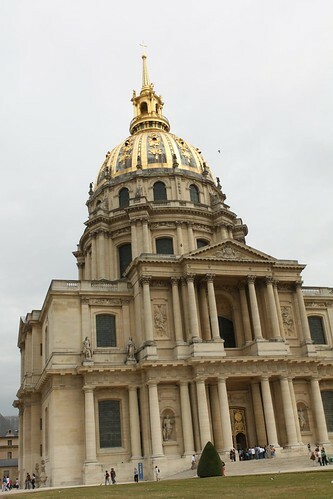 Instead we walked over to Les Invalides where I, again, did not see Napoleon's tomb. We walked along the grounds for a bit but I felt that it would be wiser to leave this as a good reason to bring us back to Paris again in the future. After all, I am a huge fan of Napolean, especially after Armand Assante's amazing performance in Napoleon and Josephine: A Love Story. Still the greatest miniseries ever made. After a nice French repeat lunch (more duck, chevre chaud, etc.) 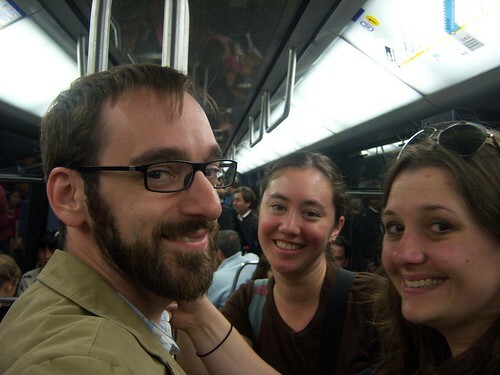 we took a subway ride back to the hotel to meet up with the rest of the group. 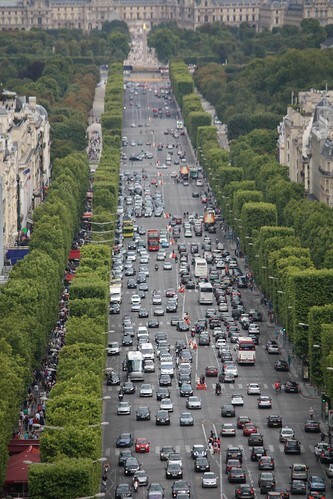 Unfortunately the rest of the group had plans to return to the Champs-Élysées for shopping. 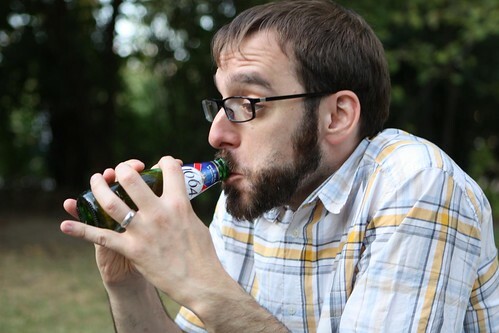 After yesterday's outing to Petite Batteau I din't think I could take another round of that. 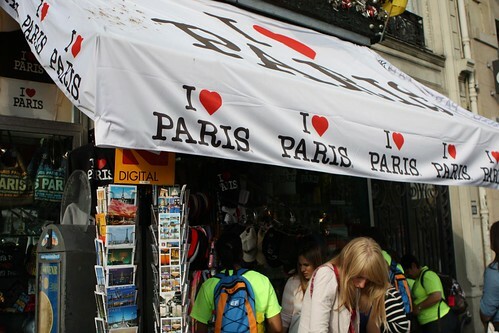 I think that may be the most boring store in the entire world. 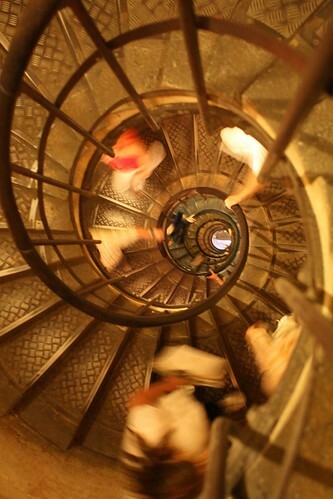 I opted to go to the Arc de Triomphe instead and climb a very tall spiral staircase to see Paris from above. The view was pretty great and I got a lot of great photographs from the top of the monument. Afterwards I descended the stairs and met up with the group who relayed the woes of waiting in terribly long lines to buy foods for dinner. 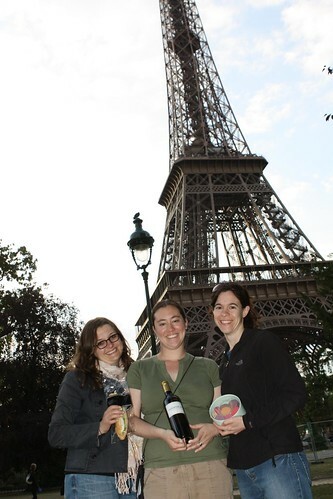 We had planned on having a picnic dinner on the Champ de Mars for our last night while drinking one of the bottles of Bordeaux we'd acquired. The only problem was that we had no corkscrew. Jen was brave enough to go into a horrific souvenir shop on the Champs-Élysées but was only able to find a terrible corkscrew for $15. 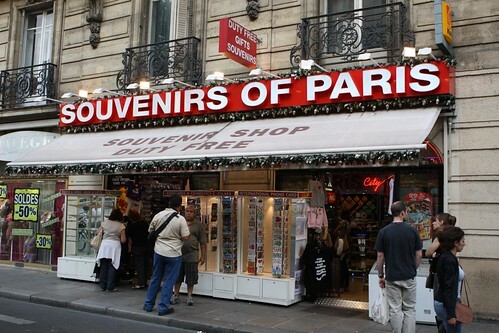 Jen is so brave that she had enough bravery to do this again in another souvenir shop off the Champs-Élysées. This time she and Elisha struck gold. Tacky, tacky gold. Oh, and by the way, it's also a refrigerator magnet. 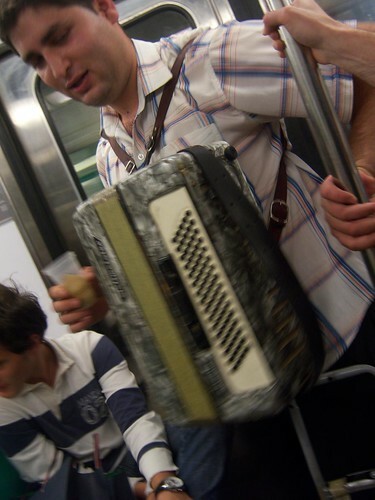 From there we jumped on the subway which got stuck in the station for about ten minutes while we were all held captive by a rogue accordion busker. He seemed to do pretty well when, out of sheer boredom, people started walking up to him and giving him money to pass the time. Dinner was a collection of sandwiches, breads, and wines that these great ladies had put together. 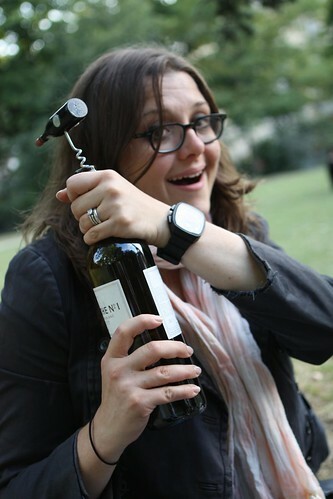 Jen exhibited pure delight as she used the ineffective and gaudy corkscrew to open our Bordeaux. 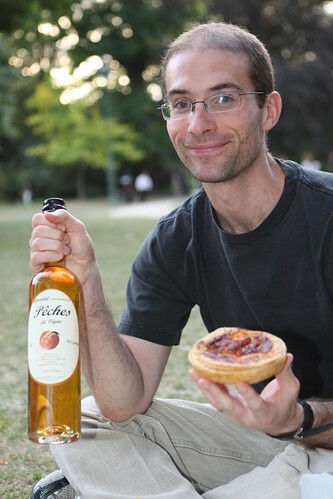 Matt's dreams came true and he was able to have quiche in France. It's so easy for all of us to be happy in life when our goals are so easily attained. Me with my sunflower photographs, Matt with his personal sized quiche. 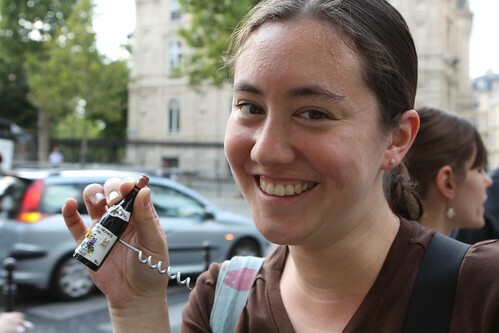 I didn't feel like Bordeaux so I took some tiny bottles of 1664 from the hotel fridge and brought them along. They were probably too expensive at €4.00 each but after so many frivolities over the past two weeks they were totally worth it. I did not, however, have the foresight to buy a tacky overpriced beer opener so I had to get creative and use a 2p piece from Rene along with another bottle of beer using a technique I'd learned in Jamaica. 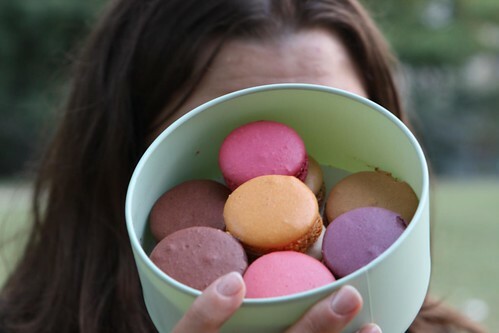 Jen and Elisha told tales of just how hard they fought to get these macarons for dessert after waiting in line for 30 minutes and paying a small fortune. They were worth the hassel. At least to me since I didn't have to do anything at all to enjoy them. To accompany the macarons we smuggled some glasses out of our hotel with us and poured some peach liqueur that we'd received as wedding favors. 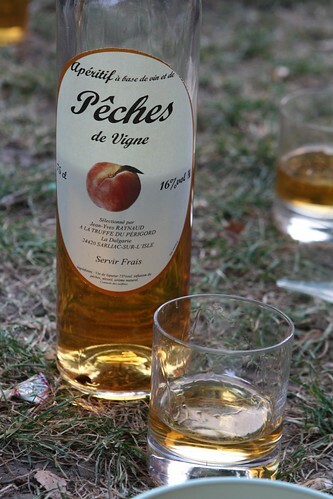 Peach liqueur will always make me remember this moment: the cool air, the sun being out until well after 10:00 PM, endless sketchy dudes walking up to us trying to sell us booze, teenagers making out inappropriately all around us. All this will remind me of our last night in Paris with friends. Tomorrow we try to fly out of Paris early to catch our connecting flight in Zurich. We'll see if luck is on our side and if our seatmates are a little more generous than those we've shared planes with in the past. Kathy says: "Whatevs! Hope you lamers get home nice and safe so you can return to America and eat at Olive Garden every night. Lame!"